I like to think of myself as someone who is interested in technology, and that if given the opportunity I will hook myself up with the latest tech, but sometimes I fail to see how a thing could really be of much use in my life. Perhaps that is my failing, even if you could argue that it is the companies failure to capture imagination. Smart-watches were one such thing – they kind of reminded me of calculator watches from back in the day, and they were only useful to me because I was in High School and needed to make more calculations than I ever have since. Get a smart-watch and you don’t have to take your phone out of your pocket seems a little different to you can carry your entire music collection in your pocket, or carry a computer around with you and be able to work on your files anywhere – these seem revolutionary, where the other seems convenience driven only. Google Glass didn’t seem that attractive as a notion, and I couldn’t stop thinking about the kind of damage that it might do to my already less than stellar eyesight. Does this mean I hit the age where I am just too damned old for the tech advancements? No, I don’t think so. I think I might have worried about this when I was younger too. The question of why do I need something popping up in my glasses strikes me as being very important – what advantages does it give me? I’m not necessarily interested in something angled at compensating for some perceived failure in my natural set up, but if there is some real way that it enhances my ability then that might something to make me bite down on the hook. I’m not even gonna go down the route of discussing Glassholes as a thing, but if a piece of technology is able to inspire its own insult then you have to know that there is something wrong with it. I think I would find it a distraction to have my phone message popping up in my glasses lens, but then I have to turn off desktop notifications sometimes too. 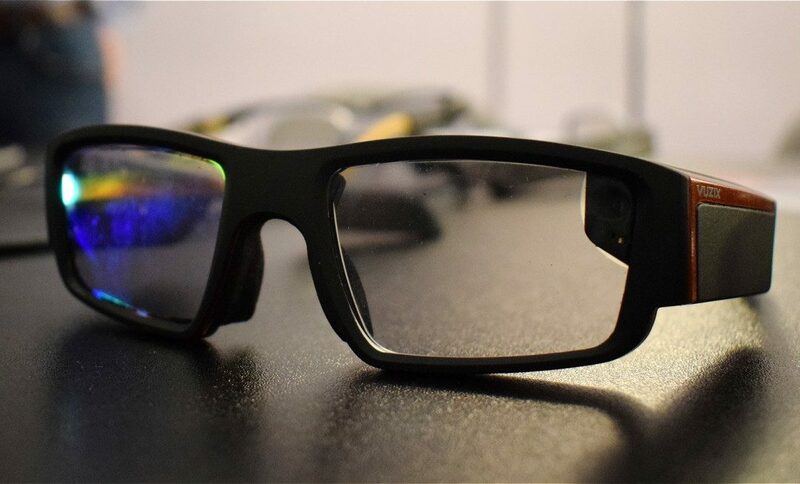 You can take pictures with Vuzix Blade, and it comes with Alexa, and while it’s not clunky like some other wearable tech that you need a support team to carry around, just think about the social impact it might have. People are already lost to the black mirror of their cell phone, and can easily be diverted away from actually being there and present when they are talking to you. I think they may be as disconcerting as those times when you think someone is speaking to you and they are actually engaged in a conversation via bluetooth. You’re talking to someone and they are actually focused on something pinging their glasses display … it may get tedious. I often use the benchmark that Elon Musk set for me a while ago – that notion that some people are working on technology that is going to change the world and take us into the future, and some people are slaving all their intelligence to crafting an app that really adds nothing to your life. Will glasses do much to improve the quality of my existence? When someone markets something to me it needs to make a case for itself pretty quickly. I could see the use of Alexa, and it kind of excited me to have the possibility of having a voice responsive home, and while the reality (having an accent not really recognised by the tech) is far from smooth, I still feel there is enough scope for the development to reach its full potential for it to be worthwhile for me to persist with the abstract word-salad Alexa sometimes spits back at me. Maybe it is early days for glasses tech – give me x-ray vision or the ability to operate in a world skinned with information, and I might use them. Give me a watch where I can get myself teleported around and I might pay for one. Now though? Not so much. But you should check it out – it may more than float your boat.